The cathegory of "theft from the person crime" is the highest ranking crime category when category crime rate is compared to the national average. "Theft from the person crime" rate is at 1124% of national crime rate which puts Western Central London on 1. position out of 104 England's and Wales' postcode areas in this crime category. 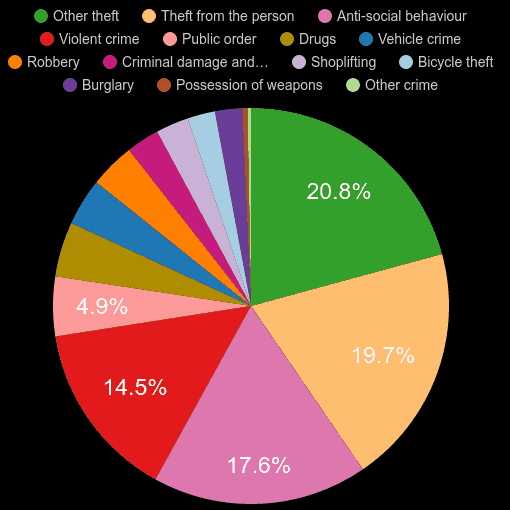 "Theft from the person crime" makes up 17.2% of all crimes committed in the area. The total number of "theft from the person crime" is 4.3k cases and has increased by 3.0% when compared year-over-year in the period of March 2018 - February 2019. For further details, click on the name of a category.